In his first campaign as Republic of Ireland manager Giovanni Trapattoni secured second place in the 2010 World Cup qualification campaign. Although the Irish were not beaten during the campaign they only managed to win four matches out of ten. Nevertheless this was enough to secure a place in the play-off series. Ireland were drawn against the highly talented French that included such talents as Thierry Henry, Patrice Evra and Nicolas Anelka. Having failed to beat either of the stronger teams - Italy and Bulgaria - in the qualification campaign there was not much confidence amongst the fans, the media or the Irish football pundits that Ireland could prevail. The first leg was on the 14th of November 2009 at Croke Park. In front of a crowd of 79,103 the play-off match kicked off at 8pm. By common consensus it was agreed that it was imperative that the Irish team kept a clean sheet thereby denying the French the advantage of an away goal. Unfortunately a deflected shot from Nicolas Anelka in the 73rd minute gave France a 1-0 victory over the brave Irish. It was a cruel blow for Ireland especially as the team had acquitted itself very well in the first half at Croke Park. The effort of limiting the French to minimal scoring opportunities took its toll on the tiring Irish team in the second half. The superior skill of the French came to the fore as the match wore on. It was particularly hard on Sean St Ledger that Anelka's shot came off him into the Irish net, as he had hardly put a foot wrong up to that point. Ireland did have a few chances, particularly a close range effort by Liam Lawrence in the first half that was deflected wide by Patrice Evra. Gignac should have made it 2-0 with 10 minutes remaining when he was presented with an open goal after Anelka had charged down Given's clearance, but he shot wastefully wide and out for a throw-in. That could have proved costly had Lloris not produced a brave block to deny Whelan three minutes from time and then pushed away another dipping effort from the midfielder, but there was no way back for the home side. Despite the second half introductions of Leon Best, Aidan McGeady and Stephen Hunt the Irish could not secure the equaliser. At the final whistle the French celebrated as though they had already qualified for the 2010 World Cup Finals in South Africa. France: Hugo Lloris; Bacary Sagna, William Gallas, Eric Abidal, Patrice Evra; Lassana Diarra, Alou Diarra; Yoann Gourcuff, Thierry Henry; Nicolas Anelka, Andre-Pierre Gignac. Substitutes: Florent Malouda for Gignac (90); Steve Mandanda; Julien Escude; Sidney Govou; Karim Benzema; Moussa Sissoko; Sebastian Squillaci. Four days later, on the 18th of November 2009, the second leg of the play-off was played in front of 81,000 fans at the Stade de France in Paris. 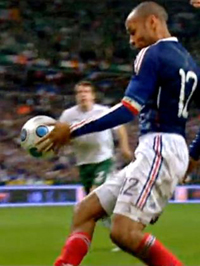 Thierry Henry lent France a hand and crushed Irish World Cup hopes. An extra time goal by William Gallas meant that France, and not Ireland, qualified for South Africa in 2010. The fact that the goal assist by Henry included two hand ball offences that were missed by the referee and linesman made it a bitter pill to swallow for the Irish players and fans. It was also difficult to accept as the performance in Paris was the best from the Irish in the whole qualifying campaign. The Irish began with serious intent and played the match further up the pitch and with support from midfield more evident than in previous matches. Even though the personnel were the same as the first leg the performance was far superior. It was not a surprise when Robbie Keane scored his 41st Irish goal after 33 minutes following excellent work down the flank by Kevin Kilbane and Damien Duff. At this point the the tie was level at 1-1 and the French away goal had been cancelled out. In the entire first half the French did not manage one meaningful shot on goal. Early in the second half John O'Shea of Manchester United spurned a fantastic opportunity to take the lead in the tie when, unmarked, he shot over the bar. Robbie Keane and Damien Duff also had good opportunities to put the tie beyond the French in the 90 minutes. The French acquitted themselves better in the second half but the Irish remained composed and looked undaunted by the prospect of extra time. The outcome of the two play-off matches turned on some of the poorest refereeing seen in the entire qualification campaign. Firstly the match officials missed a clear offside in the Irish penalty as the French took a free kick late in the first half of extra time. Paul McShane allowed Thierry Henry get ahead of him on the by-line and as the ball reached the great French forward he first stopped the ball from going wide with his hand. Then he blatantly used his hand to tee the ball up for him to cross accurately for William Gallas to nod home close range after 103 minutes. Try as they might the magnificent Irish could not eke out another goal that would have led to Irish qualification for the 2010 World Cup in South Africa. The Hand of God - The Hand of Henry - The Hand of ?